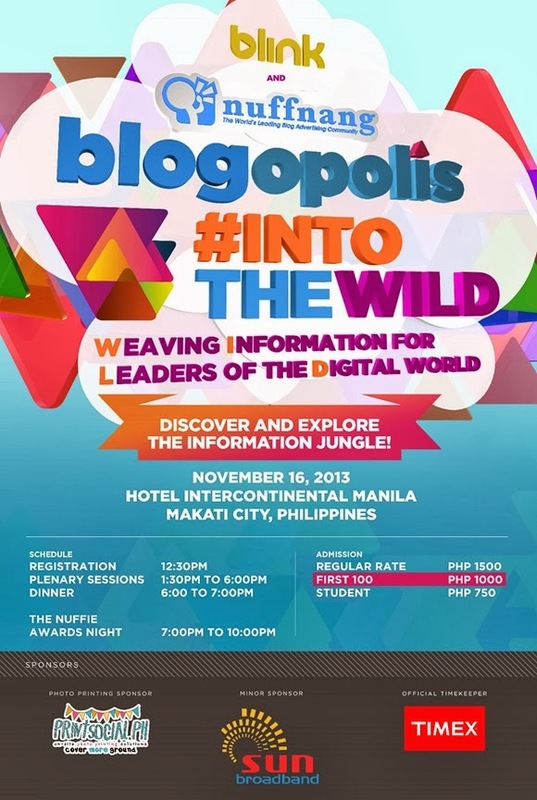 Nuffnang Philippines announced that the Blogopolis 2013 will be held on November 16, 2013 at Hotel Intercontinental Manila. This year's event will focus on the benefits of social media and other digital platforms for bloggers, social media influencers, students, and adverstisers. The hashtag #IntoTheWild means "Weaving Information for Leaders of the Digital World." Blogopolis 2013 is a day-long event starting with plenary sessions in the afternoon, and a post-conference party at night where key influencers in the industry will be awarded. This event is open to everyone - bloggers, social media influencers, students, digital marketing officers, and advertisers, and anyone who is interested in the world of digital, particularly social media. Head on the Blogopolis 2013 website for more information about the topics, resource speakers, guests, and how to buy tickets. My blogger friend and I attended the Blogopolis last year at Makati Shang-rila. We learned at lot from the speakers plus we got the opportunity to meet well-known personalities in the industry. 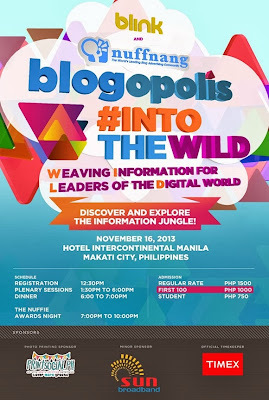 Last year’s Blogopolis focused on engaging and educating the bloggers of the ever-growing Filipino blogosphere. The conference covered topics related to blogging and its four pillars - Content, Marketing, Monetization and Advocacy. It also served as an introduction to the blogging industry with the goal of helping our community further their blogging skill set and knowledge.